Loved working with these two! 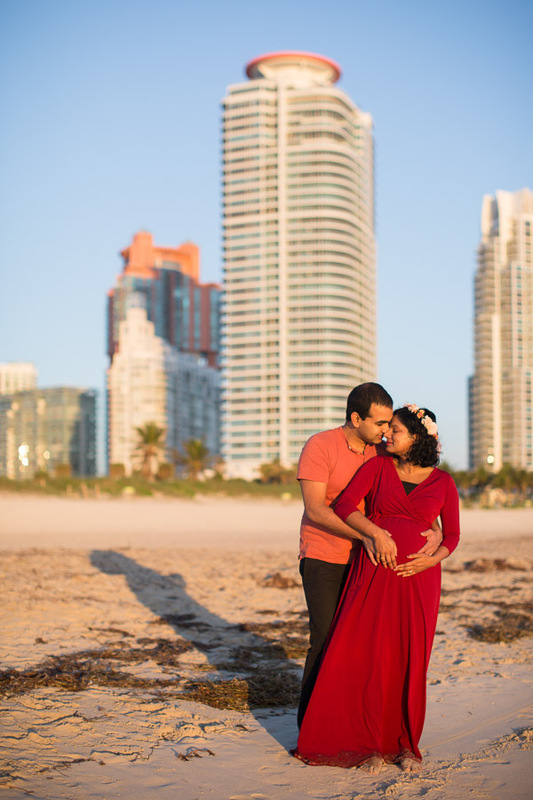 We headed to the beach at sunrise to capture their maternity session. 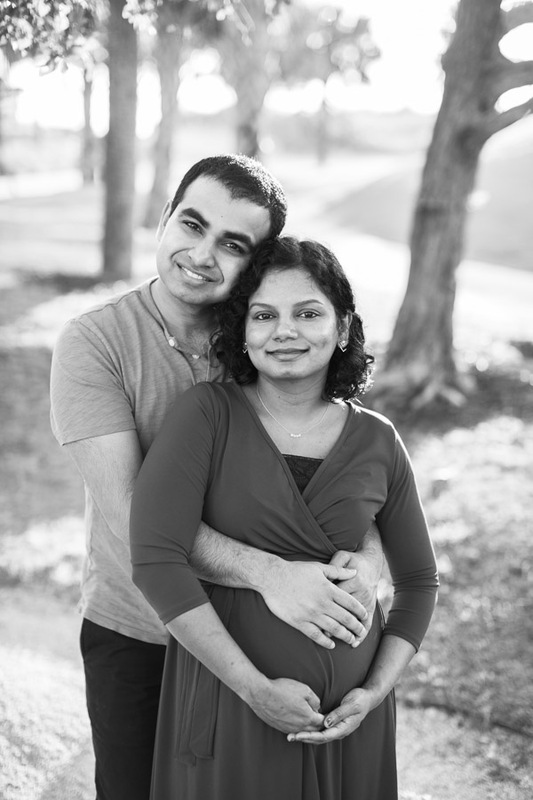 So happy and excited for them as they are expecting their first child 🙂 I know it is not easy for most people to wake up early (I am definitely not a morning person lol), but trust me when I say it is worth it, especially if you are going to book a session on a Saturday, Sunday or holiday. On a regular weekday the beach has some people but the weekends especially are crowded. 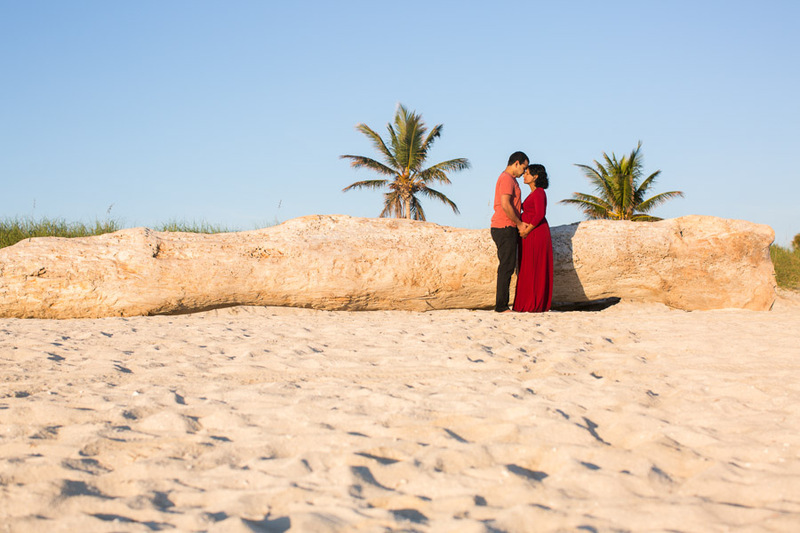 We make it work, but if you are someone who prefers not to have lots of people around, book a sunrise session! It is so calm and relaxing at that time of day, and the light is nice both in the early morning and late afternoon. This couple opted for a change of outfits in middle, and I love the different looks. I find the bold colors (red especially!) really pop against the blue of the sky and the water, while the white and blue outfits provide a totally different look that I love just as much. What is most important for any session is to wear outfits that you LOVE and you feel amazing in – and is comfortable (very important). If you plan on going in the water, wear an outfit you don’t mind getting wet in (and give me a heads up as well so I’ll be prepared! :)). 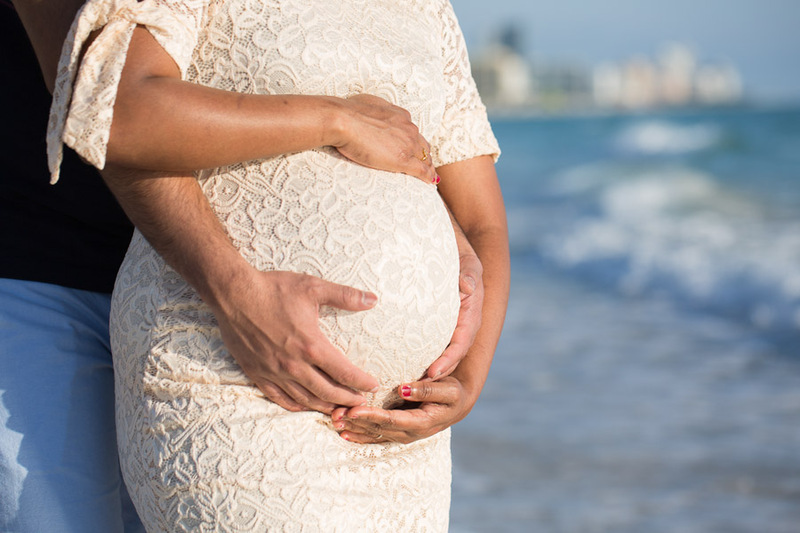 You can check out this maternity Pinterest board for ideas on what to wear. 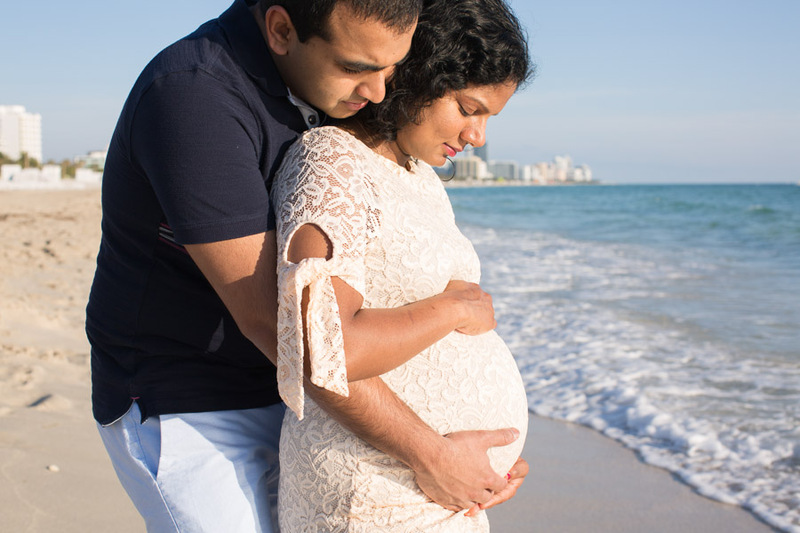 If you are wondering when to schedule a maternity session, generally it is in the 7th and 8th month, but it really depends on how you are carrying. You want to schedule the photo session when you are really showing but not at the point of pregnancy that you are very uncomfortable. 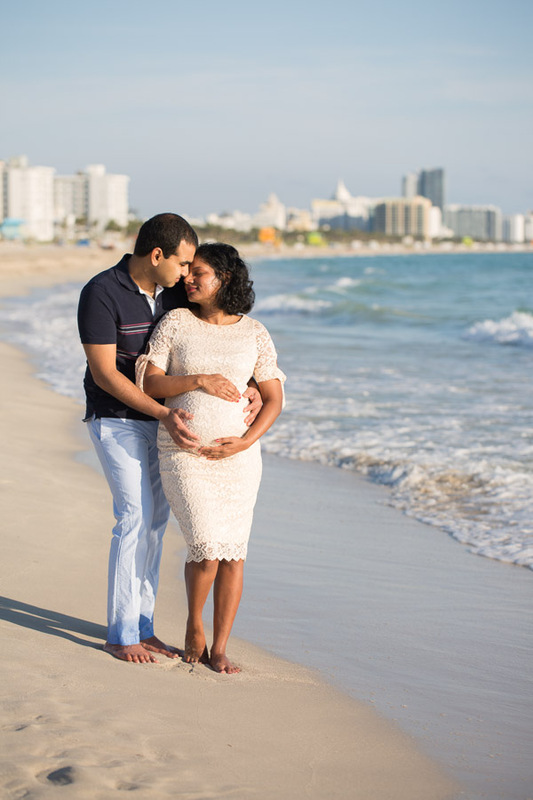 This Miami Maternity Photographer Sunrise Beach session took place at South Pointe Park. 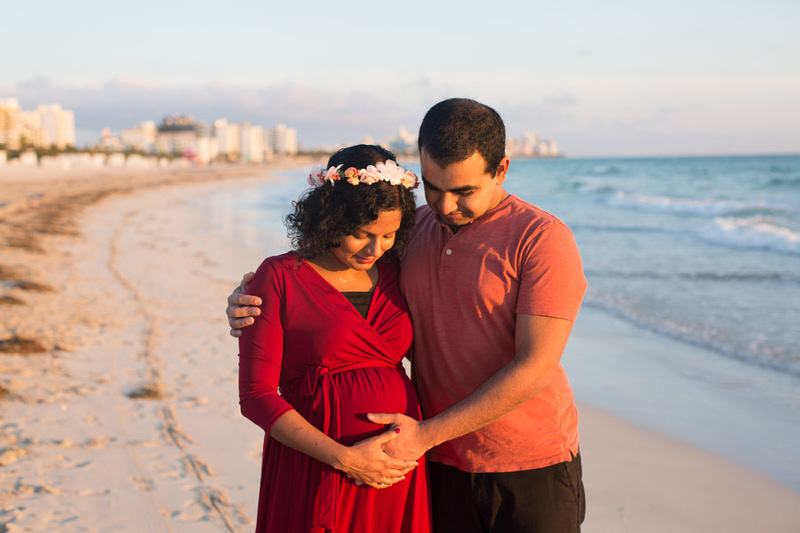 Check out all the maternity photo sessions on the blog. 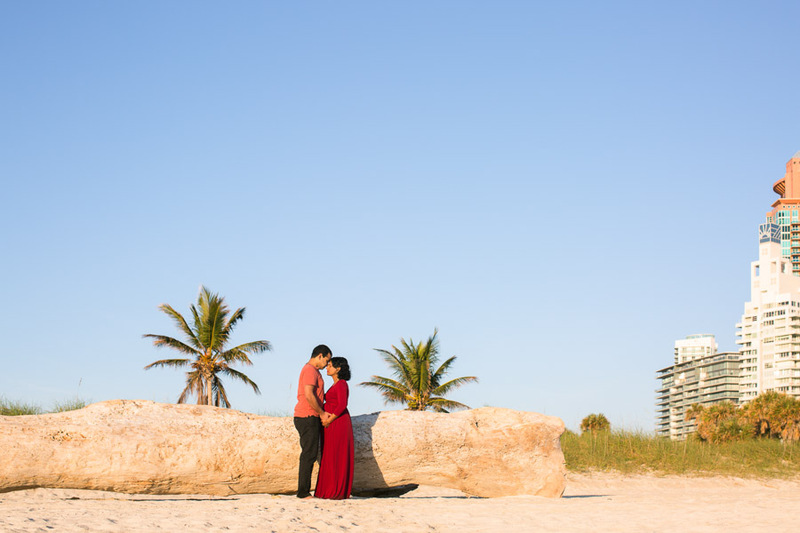 You can check the sunrise and sunset times for Miami to see the best times to schedule a session. If for example, if sunset is at 8pm I’ll usually schedule the session for 6:30-7:30pm or 6-7pm. If sunrise is at 6:45am, generally around 7-8am is a good time. If you are flexible and it is a cloudy day, I like to start the session earlier or later so we have more light to work with. If you are not flexible, no worries, we’ll make it work! 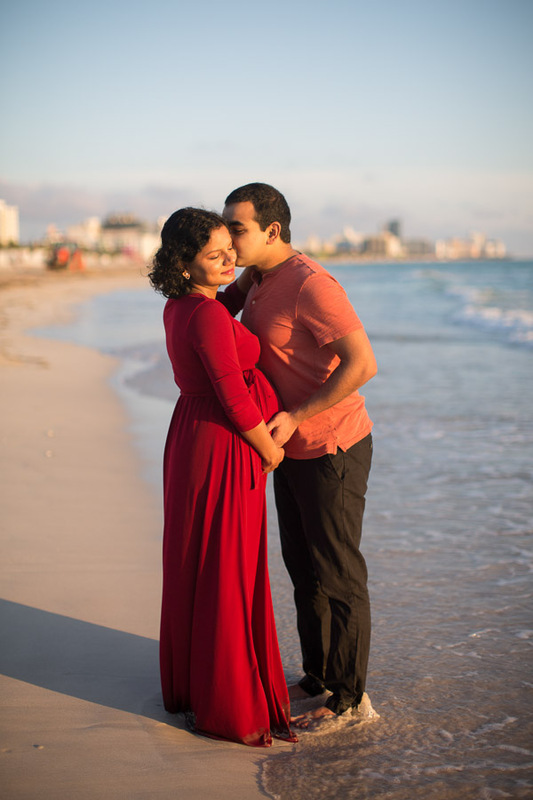 This entry was posted in Maternity and tagged Couples, maternity, Miami Beach, miami maternity photographer, South Pointe Park, sunrise on June 8, 2018 by Tova Photography.